« House shopping 101: Do you know what you don’t know? Ask me! 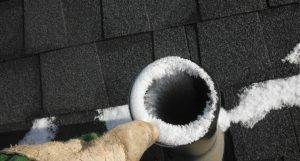 Frost build up as seen in the photo above is the reason that vent pipes must be large diameter where they pass to the exterior. The vent pipes leading to this vertical pipe through the roof are typically smaller. The vent pipe is an essential element in the plumbing drain system. It allows air in to the drain piping system to prevent siphoning of traps and to facilitate flow. Most houses have 2 or more vent pipes passing through the roof, but there is no requirement to have multiple pipes. In custom building, sometime plumbers will go to great lengths (pun?) to connect the vent pipes in the attic and make only one penetration through the roof with a vertical vent. Rain water can enter through these vent pipes at the roof, and the rain may be heard dripping in the pipes from inside the house. The rain poses no risk because the vent pipes are connected to the drain system, so the water will find its way in to the drains. Vent pipes are installed at specific locations relative to the traps of fixtures. The vent piping is connected and routed through the house up to the attic and then through the roof. Lack of connection to vent piping at modified or new plumbing installations is a common defect and is an indicator of non-professional plumbing work.